Brand New Item. Free Shipping. 99% Vacuum effect, no dust run out. Could be used alone as a nail dust collector. 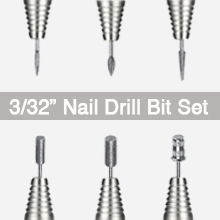 Used with a nail drill handle, the perfect partner for nail art. One of its for free gift to you. 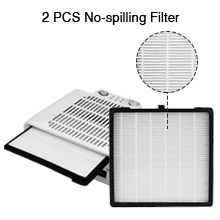 No-spilling filters ensure no leakage of dust. No need vacuum bag.Away from the water. Can be cleaned with a hair dryer. 18.9 inches long （6 watts). 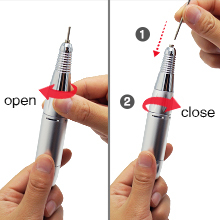 1.To remove a bit, turn the Chunk Handle clockwise in the direction until it clicks to stop and pull out a bit. 2.Make sure that the chuck is in open position, insert a bit all the way into the chuck, and turn the Chuck Handle clockwise in the opposite direction until it clicks to stop. 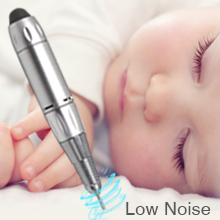 Low vibration, Low heat, Safe and long-lasting. The aluminum alloy body has good heat dissipation, and the service life is greatly improved. 25000RPM/36W is more stable and durable, adjustable speed. Can meet the different habits of the right and left hands, very user-friendly. Low noise, you can enjoy a more comfortable experience, while not disturbing the people next to you. The size of the sound changes with the speed of the rotation. It comes with 6pcs metallic nail drill bits, it is suitable for 3/32" various kinds of nail drill grinding head. Nail grinding head is safe and stable in the grinding machine. 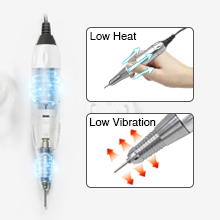 The 3-in-1 nail machine ingeniously combines the three functions of nail polishing, nail cleaning and nail lighting to bring you a different nail art experience. It has a convenient switch for easy operation, simultaneous console light, and vacuum cleaner. 25000RPM nail drill, can adjust the speed, support forward and reverse, to meet the habits of the left hand and right hand. A variety of different shapes of grinding heads and sand rings are covered. Large the vacuuming area, and two hands can be placed at the same time for polishing nail and vacuuming nails crumbs, it will improve the efficiency of the nail operation. Two pieces of vacuum filter screen(Free) are provided for cleaning and replacement. 1. Connect with 12V/4A adapter, the power can be connected. 2. 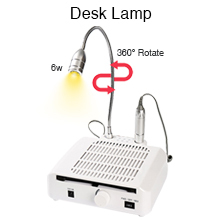 Turn on switch "Lamp+Fan", the lamp and fan start work; Turn on "Lamp", the lamp works ONLY, the lamp is free to be adjusted in different angles; Choose "off", the nail drill off work. 3. 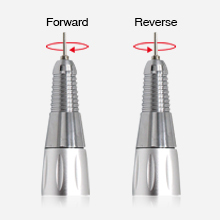 Adjust the Speed control of nail drill, and choose the "FWD" or "REV" direction for your better use. Choose "off", the nail drill off work. 4. Take out the dust collector drawer and clean it after every time uses it.